When Scientology goes to court, it likes to play rough -- very rough. A judge gives the church a delay so it can fight for the privacy of a practice it compares to confession. Church staffers were "negligent" in Lisa McPherson's death, but that's no reason to charge the church, motions say. Circumstances in the death of church member Lisa McPherson are described in court as disturbing and bizarre. A judge says a jury may decide on damages in the case of Lisa McPherson, who died after being cared for by church members. 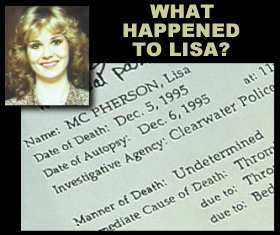 why hasBenetta Slaughter incorporated the Lisa Foundation andLisa McPherson Foundation ? A critic of the church is arrested in the assault of a church member as a video camera films the incident. Later Minton was foundnot guilty by six jurors. Clearwater police haven't actively investigated the controversial church for several months. The church alleges the aunt of a woman who died while in church staffers' care forged a key document used in setting up an estate. Robert Minton intends to buy property in downtown Clearwater. Meanwhile, a restraining order against him is extended to Nov. 29. Church officials say the timing of thesidewalk project has nothing to do with the annual demonstrations planned in Clearwater. A judge orders a Scientology critic to avoid church property; a staffer must avoid the critic. Protesters from all over the nation and some foreign countries are gathering to picket the Church of Scientology's World Headquarters at the Ft.Harrison Hotel. It's all in memory of Lisa McPherson . . . The church spray-paints boundaries near its buildings to show protesters where they cannot go. Pictures of theorange lines and 4 Dec `99candle light vigil for Lisa. Link toreports of the Clearwater protests. A trust, organized to fight Scientology, will set up offices near the church in downtown Clearwater. Scientology cannot rely on an argument of spiritual assistance in Lisa McPherson's death, prosecutors argue. When can a church be accused of a crime? It could be a year before a Pinellas judge makes a decision whether a critical document in an $80 million lawsuit against the Church of Scientology was forged. After a second day of testimony Friday, a Probate Court hearing to decide the fate of the Lisa McPherson estate adjourned with no resolution. Attorneys on both sides agree that the complex case will not be ready for trial in March. The trial is set to last five weeks. The legal drama that began with the 1995 death of Scientologist Lisa McPherson just got a little longer. Can't find what you are looking for? Give thesite search a try.